Each machine undergoes rigorous testing in our research and development facilities here in the UK before it is dispatched to you - this process takes up to an hour per machine. This machine has the revolutionary ability to be able to HEAT as well as cut allowing the freeing of rusted nuts etc and also bending of components. It's fitted with a fully variable control for heating and a selector switch for heating mode - in normal cutting mode the machine performs exactly as the CUT 50 Pilot Pro. This machine has a much higher duty cycle than other machines available and has been designed to work hard - it is a heavy duty machine! We are plasma cutting specialists with a huge amount of experience with plasma cutters both in design and use. This is one of the most comprehensive warranties available on this type of machine in the UK - and it is included free with every machine! Time to throw away your angle grinder! 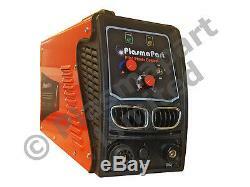 This is the PlasmaPart CUT 50 plasma cutter - it is a 240v 50 amp machine with serious performance. It will cut 21mm steel plate down to paper thin metal sheet cleanly and quickly. Some users with a steady hand can achieve severance cuts in steel up to around 25 mm! Cutting amperage is infinitely variable, and the unit is electronically protected from overload as well as short circuit etc etc. We have specified the machine to use a high quality torch that uses by far and away the cheapest consumables on the market per mm of cut allowing perfect clean cuts to be performed whilst not costing any more than they need to - keeping your running costs low. The machine is fitted with a full power pilot arc DuraSlice P80 6 metre torch making easy perfect starts every time and accurate starting points on the material as well as being able to ignite in mid air - great for burning through thick rust, coatings and paint as well as being perfect for mesh and bar materials. Each machine undergoes a full test and inspection lasting around 1 hour before it leaves our research and development facilities here in the UK before heading to you. Every machine is supplied with everything you need to get cutting. PlasmaPart CUT 50 Pilot Pro plasma cutter with heating function. 1 Pair of shade number 5 plasma cutting glasses. Air regulator / filter and air line (1m PCL connection). Full instructions & quick start guide. We have many pack sizes of these available in various nozzle sizes. These are all available from our. Wheeled Guide and circle cutter an excellent piece of kit allowing the accurate cutting of circles with the plasma cutter, it also doubles as a wheeled guide for cutting straight lines against a straight edge such as a piece of box section. All of our products are displayed. And include a full VAT invoice. Any questions please feel free to ask - if you require different quantities please ask and we will do our best to satisfy your requirements. Please contact me if you require any further information on parts including. And other products including a full range of spares for this torch and system. We are a plasma cutting specialist and carry a full range of spares and consumables for a huge range of cutters - we also supply our own range of very high quality machines. All parts and spares are available in different quantities. Many thanks for looking at our products Kind regards - The PlasmaPart Team. The item "Plasma Cutter PlasmaPart CUT 50 50Amp Torch, All Accessories, 2Yr Warranty! PP56" is in sale since Wednesday, July 12, 2017. This item is in the category "Business, Office & Industrial\Metalworking/Milling/Welding\Welding & Soldering\Welding\Welders, Cutters & Torches\TIG Welders". The seller is "plasmapart" and is located in Keyworth, Nottinghamshire.